Interested in moving beyond Legos? Learn about the engineering behind thrilling roller coaster and amusement park rides! What makes you feel that rush when you are diving down a steep hill or rounding a curve? Students working in teams will be using our K'Nex dynamic, open-ended, spatial building system to build and experiment with action-packed working models conduct engineering experiments. 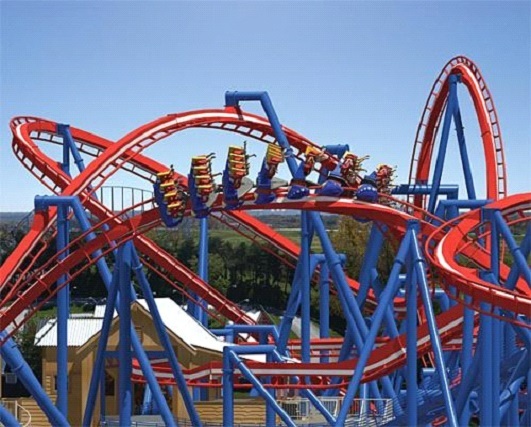 Models include different roller coaster ramps, various looping systems, gravity hills, and other amusement park thrill rides. On the last day, students can build, experiment with, and modify one of our 3 feet tall Thriller-Roller Coaster models and try to create the fastest, biggest, baddest roller coaster imaginable.